When I was taking the train north, I fell asleep in northern California and awoke to sunrise in Oregon. The dry desert-like environment was replaced by the foggy forests and mountains one typically associates with the northwest. You won’t be surprised that it was rainy when we arrived. You can view the AAS meeting’s program online, and you can check out everyone’s live-tweeting at #aas225 too. Jessica Kirkpatrick, Caitlin Casey, and Kartik Sheth organized an excellent session on the impostor syndrome, and from what I could tell, it was very successful. They packed a large room, and graduate students as well as more senior scientists actively participated in the event. The organizers will soon be posting about it and about survey results on the Women in Astronomy blog, so watch for that. drop-out rate among women than men in astronomy. Consequently, impostor syndrome is not just harmful to the health and success of the many people who experience it but is also harmful to science in general. Men (including me) experience impostor syndrome too, as do many minority groups such as black and Latino scientists. According to a survey of astronomers planning to the attend the AAS session, 56% of them are experiencing or have experienced severe impostor syndrome. This is clearly an issue we must try to address, and this involves identifying, assessing, and reversing the effects of impostor syndrome. In my opinion, all of this is great, and more sessions like this should be organized in future AAS meetings. Encouraging everyone and dealing with sources of doubt will help all scientists and students to gain confidence, and this is an important step toward achieving equality in STEM fields. In addition, people at universities and other educational institutions should make an earnest effort especially at the level of graduate programs to discuss and address these issues. Unfortunately, straight white privileged men seem to be the most unaware of these issues are also the people most often in leadership positions and most unlikely to have attended this session. Talking about these issues openly and consistently should help to make everyone more aware of them. In a town hall-style session, people from the AAS publishing program described potential changes to the main journals, including the Astronomical Journal (AJ) and Astrophysical Journal (ApJ) (where I have published papers before). I expect that many of these changes will be officially announced in more detail later this year. The details will mostly just interest professional scientists who frequently read and publish in these journals. There are plans to balance content in ApJ and AJ and to have one centralized portal for submitting papers. They will eventually do away with ApJ Supplements, as the distinction between them and regular ApJ papers is not as clear as before, and in any case, in an age where most papers are accessed online, the distinction is basically irrelevant. They are planning on technological enhancements in the journals in the future, such as including 3-dimensional figures, video abstracts, and staff support with graphics. Finally, rather than just having ApJ Letters, they proposed the creation of AAS letters, which would highlight the most important research of both the AJ and ApJ and which would not have as strict a length limit. During the Q&A period, there were comments about open access and about the contrast between the AAS business model and that of the Royal Astronomical Society, which publishes the Monthly Notices of the RAS. In my personal opinion, I think open access journals are generally a good thing, and I prefer the MNRAS model, in which scientists do not have to pay to publish papers; in effect, the cost is paid by libraries and other institutions. In other publishing-related news, a new open-access scientific journal, Collabra, was just introduced in the UK, in which they plan to pay peer reviewers and editors. As I wrote in my previous post, where I described my train trip to the AAS, I recently joined the AAS Sustainability Committee. The committee organized a splinter session called “Teach Climate Change!” that was led by James Lowenthal (Smith College), Katy Garmany (NOAO), and others. The session mainly consisted of: (1) discussions about how to teach climate change in an introductory astronomy course; (2) how astronomers can engage in public debate on climate change issues; and (3) how we can address sustainability through control of “light pollution,” though we ended up having not much time for that topic. We had many lively discussions about these topics and audience members had many excellent ideas. Many people advocated for astronomers to engage in more public outreach programs, including with museums such as the California Academy of Sciences. When teaching a class, it’s useful to assess students’ views anonymously such as with “clickers,” and students can calculate their own carbon footprint on the Environmental Protection Agency’s (EPA’s) website, which would help make these issues more concrete. For interested readers, Lowenthal recommended the 2010 book, Merchants of Doubt, by Naomi Oreskes and Erik Conway, which compares climate change misinformation to that of the tobacco industry. We will make more information and resources available in the future, and in the meantime, I suggest checking out the Sustainability Committee’s website and blog. Finally, at a reception on 6th January, Rick Feinberg, the AAS Press Officer, announced the science writing awards. Alexandre Witze won the 2014 American Institute of Physics (AIP) Science Communications Award for her excellent article, “Spinning the Core” in Science News, on magnetic dynamos. Lee Billings won the award in the book category for his “Five Billion Years of Solitude”, published by Current/Penguin. I look forward to reading it! You could say that I attended the AAS meeting as an astronomy researcher, astronomy policy analyst, and beginning science writer. 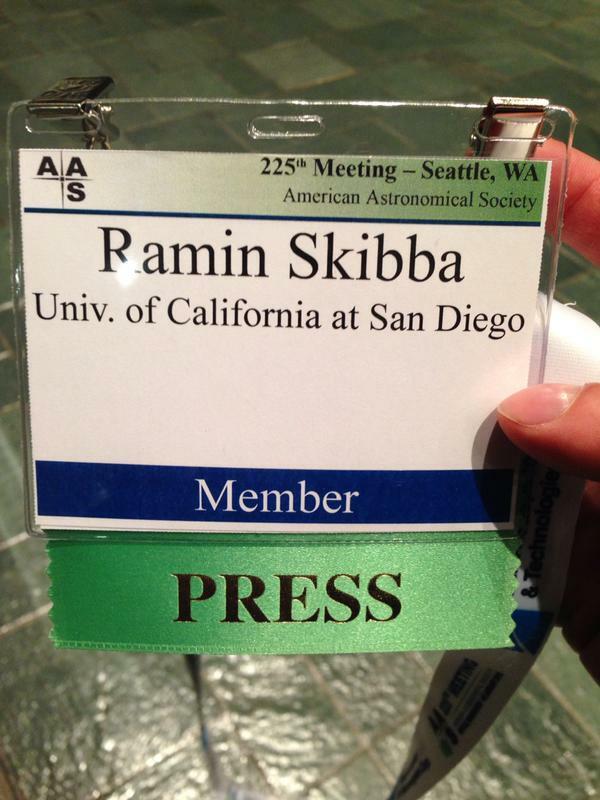 Here’s my badge—for the first time, I was registered as both press and as an astronomer. It’s interesting seeing things from the other side. ← All Aboard to the American Astronomical Society Meeting! More details about the publishing changes have been announced, and they’re generating a lot of debate among astronomers.